Mini juicy pork dumplings at Gourmet Dumpling House in Chinatown. Gourmet Dumpling House has had a line out the door pretty much since owner Ed Chen opened up shop 10 years ago. The restaurant regularly appears in online travel guides and on best-of lists. But does this cramped, crowded Chinatown institution still live up to the hype? 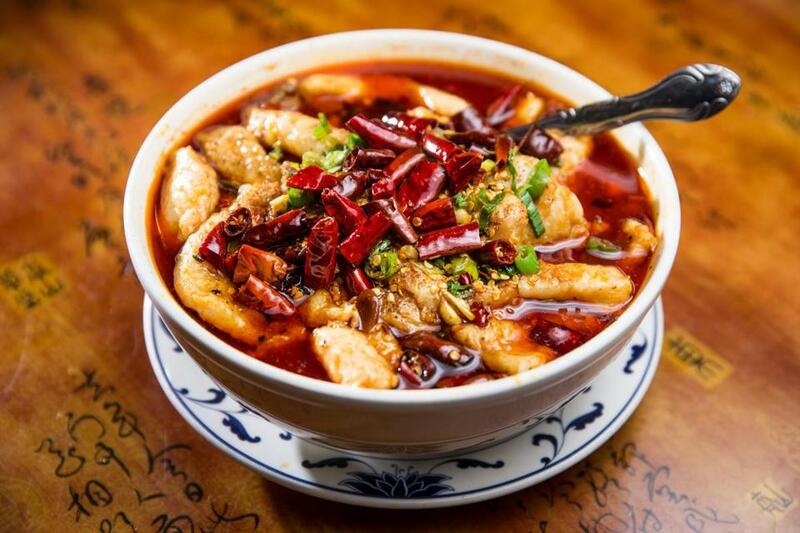 In the past few years, Greater Boston has welcomed plenty of new restaurants serving excellent food from all over China — everything from closet-size spots offering specialties like hand-pulled noodles and hot pot to Woburn’s Baldwin Bar, which mixes world-class cocktails with mouth-numbing dishes from Sichuan. Many Chinese restaurants do the food of one region particularly well, then fill in the menu with Americanized dishes like General Gau’s chicken and crab rangoons, with the hopes of pleasing Western palates. GDH takes a different approach. The Chinese symbols on the restaurant’s blue signage roughly translate to “Special flavor from both the North and South.” Indeed, you’ll find an extensive menu of hits from Canton lobster with vermicelli to Shandong dumplings, and everything in between. 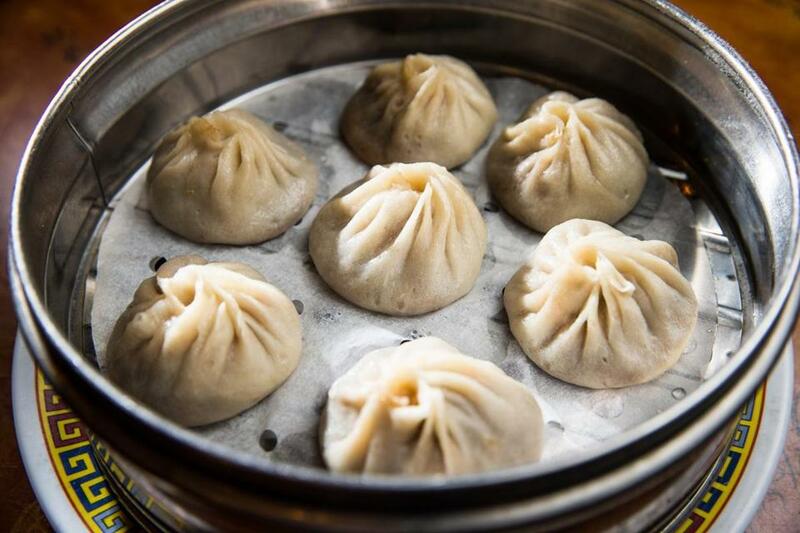 Of course, many diners queue up to make a meal of those dumplings and other steamed buns, particularly xiao long bao, the slurpable soup dumplings billed here as mini juicy dumplings (pork $7.95, pork and crabmeat $8.50). Bamboo steamers are filled with seven neat little pouches; sometimes your server forgets to bring you black vinegar with shreds of ginger, so be sure to ask for some to pool in your spoon before you plop on a dumpling with your chopsticks. You know the drill: Nibble off a corner to release the scalding steam, slurp out the rich, porky soup, and gobble down the rest in one bite. The plain pork dumplings are crowd pleasers; the crab adds a funky note that’s quite tasty if you enjoy a briny bite. Pan-fried leek and pork buns ($6.50 for 4) arrive too hot to safely handle. Wait patiently before you bite into the airy, slightly sweet bread — crisp and burnished on one side — that’s filled with an (also slightly sweet) amalgam of meat and allium. A Chinese answer to a British pasty or Aussie meat pie? They are just as comforting and twice as delicious. Sliced fish Sichuan style at Gourmet Dumpling House in Chinatown. Of course, order the dumplings, but don’t let this restaurant’s American name fool you into filling up on those alone. Leave room for dishes like the sliced fish Sichuan style ($15.95), which arrives teeming with chiles, Sichuan peppercorns, and cabbage, billowing steam from a melon-size bowl. Incredibly, there is an “XL” version available for $21.95. The tender white fish has a lingering heat, a pleasant tingle rather than a big burn. If you’re looking for more fire, try another Sichuan specialty, sautéed beef julienne with longhorn peppers ($13.95). It’s shy on the mouth-numbing peppercorns but packs plenty of sizzle from the fresh, sliced green chiles mixed with the savory slices of meat. Cool down with sautéed snow-pea tips ($14.95). Blanched bright green and slicked with garlic oil, they’ll convince anyone to eat their veggies. The vast menu can feel overwhelming. The section of chef’s specials is always a good place to return. 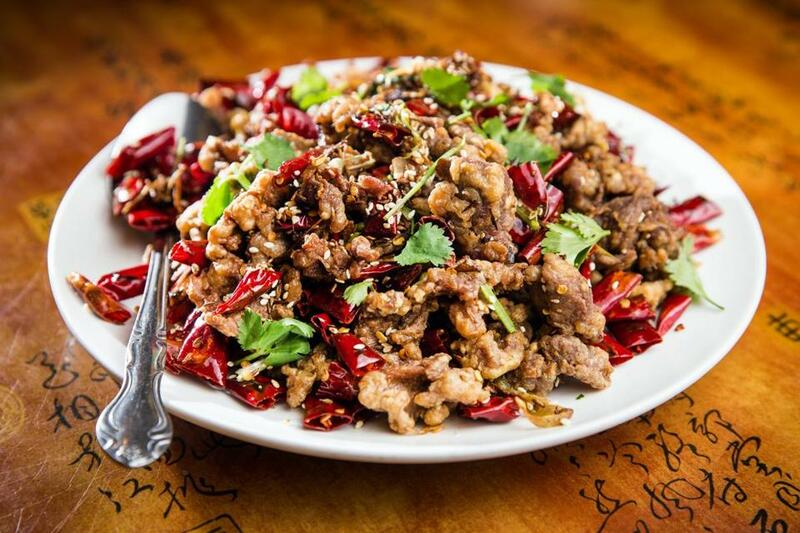 Cumin lamb ($17.95) is a looker of a dish, a heaping platter of golden-fried pieces of tender lamb topped with toasty red chiles, Sichuan peppercorns, and cumin seeds, garnished with cilantro. It’s hard to stop eating the pleasantly gamy bite-size bits; think popcorn chicken for grown-ups. This plate of food alone is worth that line out the door. The sight of the line snaking down the block can be daunting, but it moves fairly quickly. And if you go off hours, you might be seated right away. In a party of one or two, it’s not unusual to be whisked past patrons in larger parties and seated at a communal table. It’s a great place to meet adventurous eaters who will inquire about your big bowl of fish. Go ahead and offer that stranger some — there’s more than enough to share — and they just might reward you with a salty-sweet sautéed pig’s foot over rice ($7.95). It’s gelatinous enough to leave your fingers sticky, and if you’ve ever enjoyed gnawing the end of a Southern-style barbecue pork rib, we are willing to bet you’ll be delighted by these trotters. Gourmet Dumpling House has so much to offer, from north to south. Dumplings are just a gateway drug. Cumin lamb at Gourmet Dumpling House in Chinatown. 52 Beach St., Chinatown, Boston, 617-338-6223. All major credit cards accepted; not wheelchair accessible. Prices Appetizers $3.95-$14.95, dumplings $4.50-$8.50, lunch specials $8.50, entrees $3.95-$23.95 (most dishes under $15). Hours Daily 11 a.m.-11:30 p.m.
What to order Mini juicy dumplings with pork, sliced fish Sichuan style, sautéed beef julienne with longhorn peppers, cumin lamb. Catherine Smart can be reached at cathjsmart@gmail.com.